We love to top up our industry knowledge, and back in May Jas and Ross did just that by attending a course on serviced apartments and their benefits to corporate clients. It is well-known that the demand for serviced apartments (over 800,000 worldwide and increasing) is growing faster than new supply is coming on to the market, but why is this? Corporate clients often choose serviced apartments due to cost per night, length of stay and location. Security is also a really important factor and often gated communities or manned reception desks are a big plus. 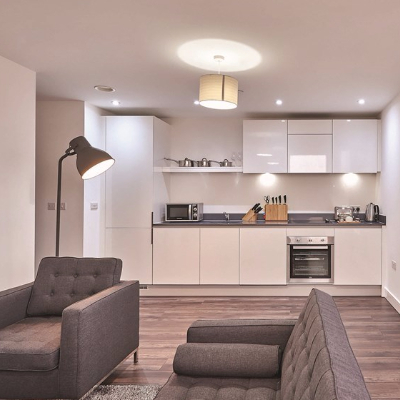 One statistic showed that of those who have stayed in a serviced apartment, 79% prefer them to hotels; this could be due to having the flexibility to cook your own food, wash your own clothes and usually having a living space to utilise too (often 30% more space in total!). Budgeting for accommodation can also be a tough challenge for corporate companies who have members of their workforce in different locations for different length stays and when the average achieved rental rates reflect a 10- 20% discount to hotels, it’s easy to see why serviced apartments are becoming such a hit. With the standard length of stay for a serviced apartment ranging from 1 week to 1 year, serviced apartment providers have to be on top of their game when recognising what individual corporate guests will require. This can include the use of home-away-from -home comforts such as Sky TV, high speed Wi-Fi or even social events for guests – such as having an on-site Chef to come and do your meal for you! If you feel like using serviced apartments would work for your company, help to standardise your accommodation requirements and provide a home from home for employees staying away, feel free to get in touch with Ross or Jas and we would both be delighted to chat more!